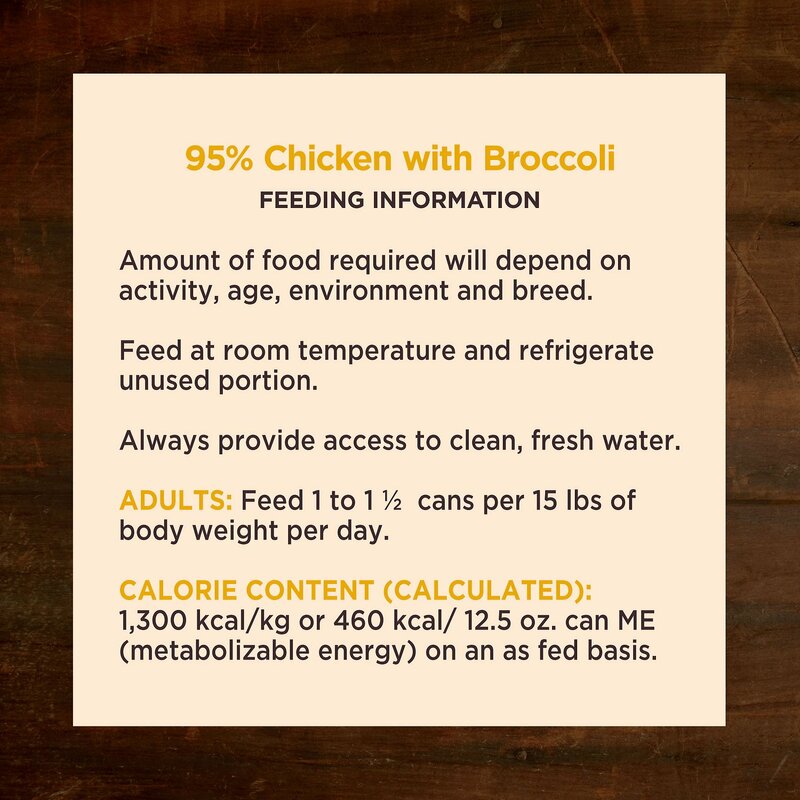 Mealtime is the perfect time to nourish your pup so he can thrive from the core, so give him the deliciousness and nutrition of the Wellness CORE 95% Grain-Free Chicken & Broccoli Canned Dog Food. 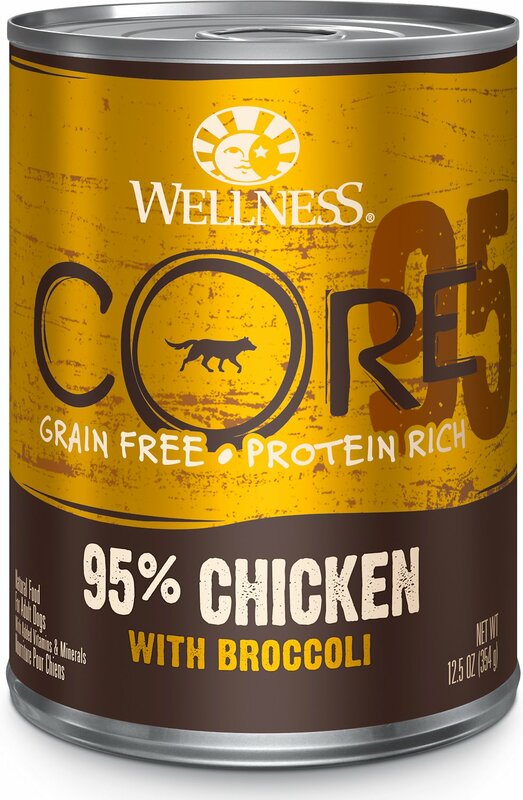 This 100% grain-free, protein-packed formula is made with a single, pure protein source and an antioxidant-rich superfood to provide your dog with the nutrition he needs, with no wheat, corn, soy, meat by-products, artificial colors, flavors or preservatives. 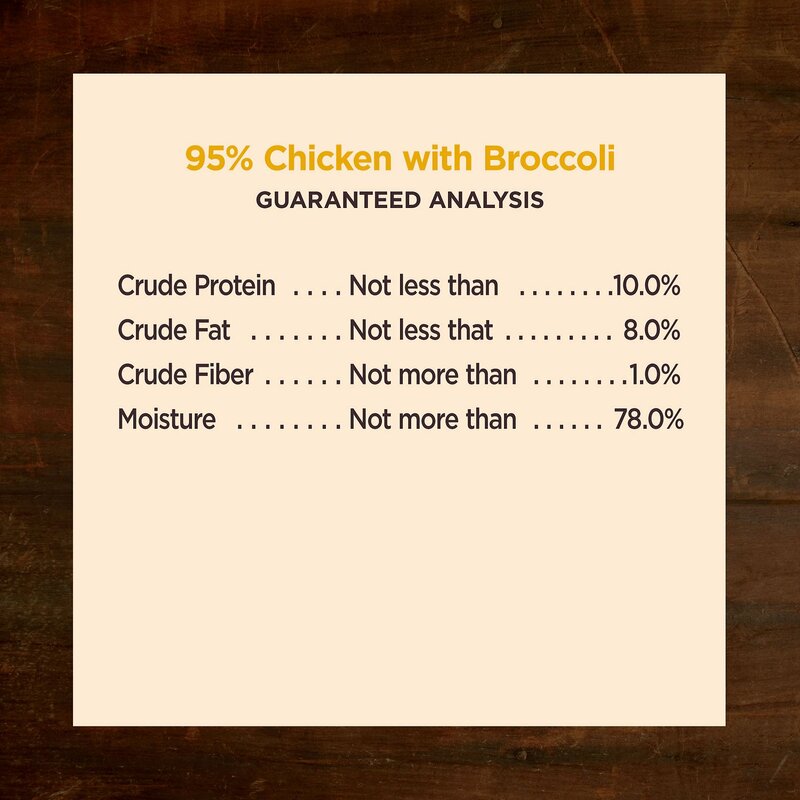 While your pup licks his furry lips, you can feel good about giving him the complete nutrition of real chicken to help maintain lean body mass and muscle tone, antioxidant-rich broccoli for overall wellbeing, plus essential vitamins, minerals, and fiber. Plus, it contains flaxseed that’s high in omega-3 fatty acids to help support a healthy skin and coat. Thanks to its ready-to-use formula and easy-open lid, it’s easy and quick to give as a complete meal or a delicious, nutritious food topper. Provides a complete and balanced diet with a grain-free, protein-focused formula made with one single protein source and an antioxidant-rich superfood. 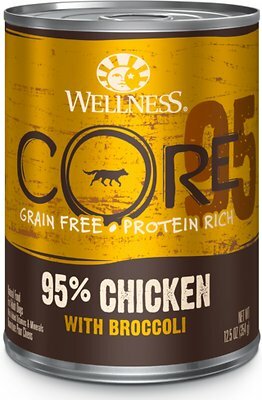 Lean chicken for high-quality protein, broccoli for fiber and vitamin C, and ground flaxseed for omega-3 fatty acids, plus vitamins and minerals. High-protein formula helps your pup maintain lean muscle mass and a fast metabolism, while antioxidants from real veggies improve overall wellbeing. Convenient easy-open lid makes it easy to give as a complete meal or a delicious, nutritious food topper. Contains no grain, meat by-products, wheat, corn, soy, artificial flavors, colors or preservatives. 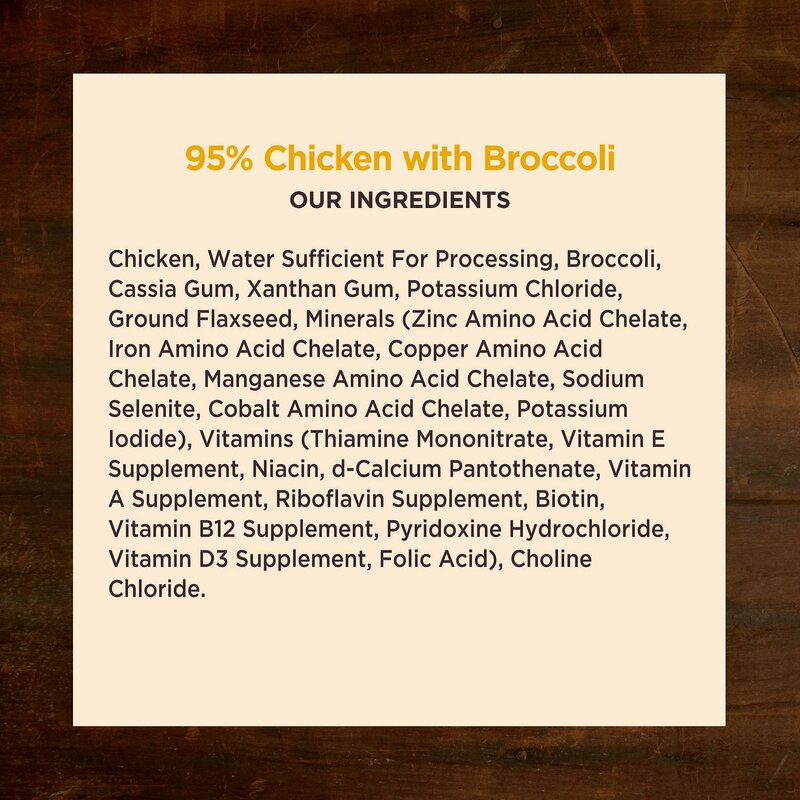 Chicken, Water Sufficient For Processing, Broccoli, Cassia Gum, Xanthan Gum, Potassium Chloride, Ground Flaxseed, Minerals (Zinc Amino Acid Chelate, Iron Amino Acid Chelate, Copper Amino Acid Chelate, Manganese Amino Acid Chelate, Sodium Selenite, Cobalt Amino Acid Chelate, Potassium Iodide), Vitamins (Thiamine Mononitrate, Vitamin E Supplement, Niacin, d-Calcium Pantothenate, Vitamin A Supplement, Riboflavin Supplement, Biotin, Vitamin B12 Supplement, Pyridoxine Hydrochloride, Vitamin D3 Supplement, Folic Acid), Choline Chloride. 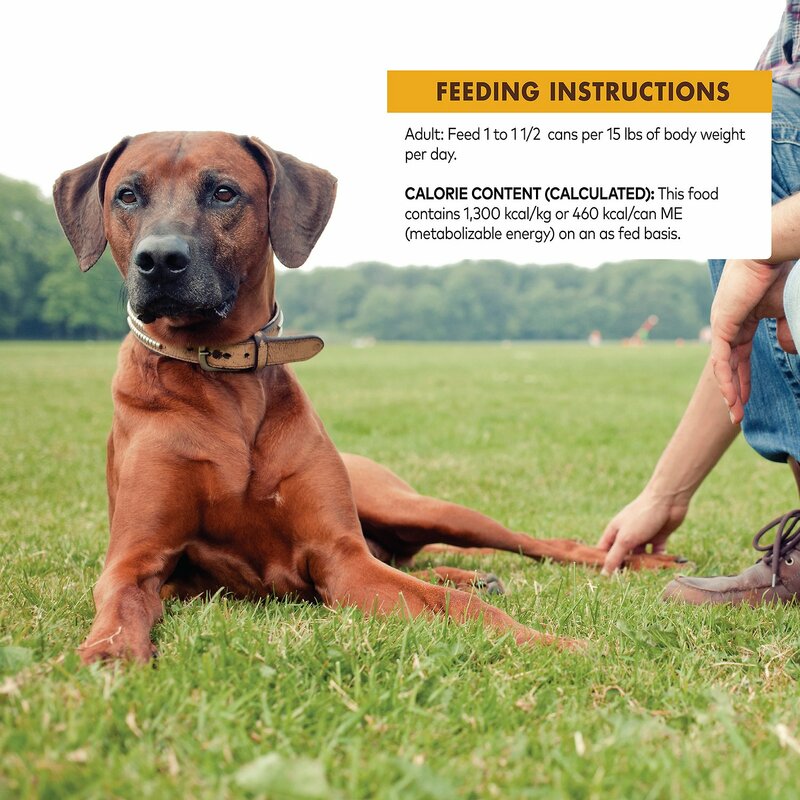 Adult: Feed 1 - 1 1/2 cans per 15 lbs of body weight per day. The best way to transition onto a new food is to gradually introduce the food by mixing it with the old diet. 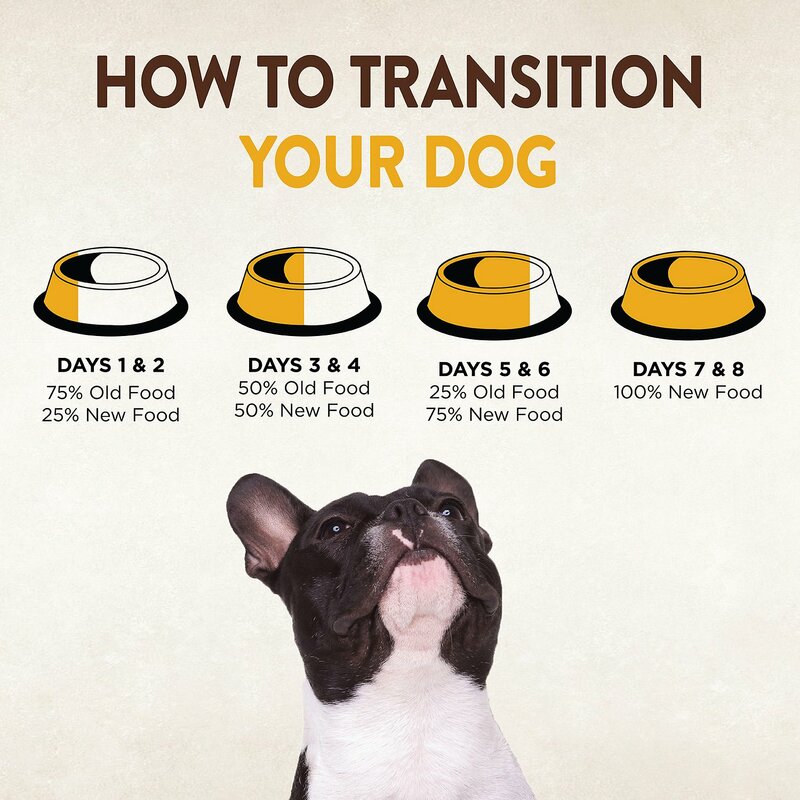 Mixing the food will allow the dog to acclimate to the new taste and not overindulge on the new food. When it is good, it's good, but sometimes not so much! The only drawback to buying by the case is getting a bad batch: comes with a jelly like layer on the top. That makes the can very soft and gooey. Because you have purchased a case, every can in the case has the same gooey consistency. They need better quality control!!! After making the mistake of trying halo senior formula I couldn't wait to put my 3 lb chi and 12 lb Maltese back on this food. We only tried the other thru two cans and it made both of them sick. I highly recommend this food and I should never have tried halo. Dogs enjoyed eating this very much! Excellent ingredients. I mix it with Wellness 95% Chicken Grain-Free canned (5 out of 12 cans dented) since they love the topper even more. Not sure if I’ll buy again from Chewy. 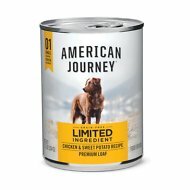 Perfect, simple recipe, quality ingredients, dog enjoys it. I placed the order and as usual it arrive quickly at an excellent price. Chewy in the last 2 years has never disappointed me. I have 2 dogs and find Chewy has the best prices for their food and treats. 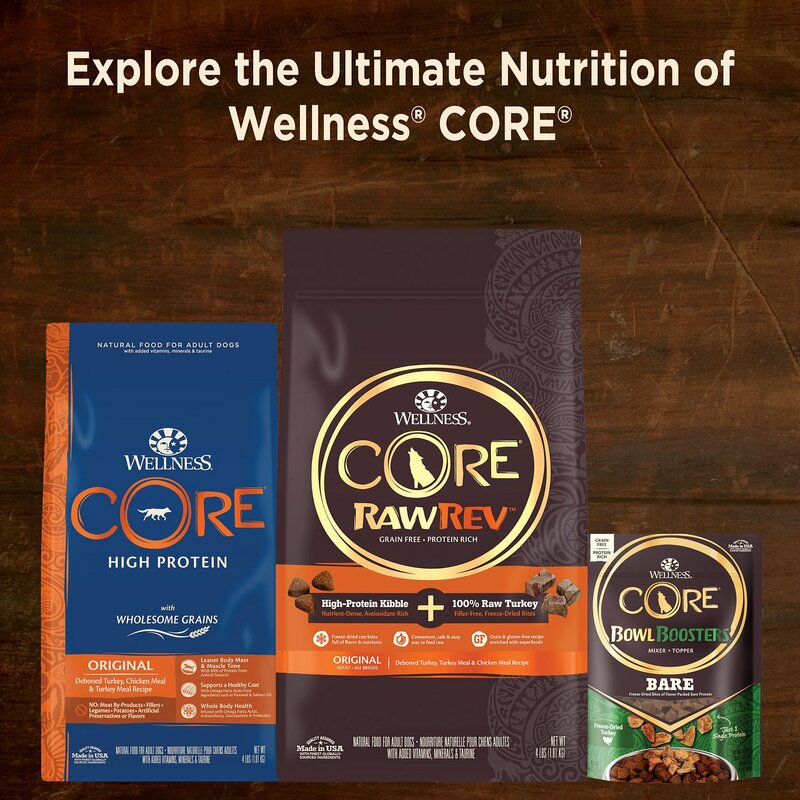 I highly recommend this product plus other Wellness Core flavors. Our chihuahuas love this food. It is made with quality ingredients and comes in 2 different size cans. All I can say is that my dogs are happy to eat this food 2xs a day, every day.